... has six chapters: Belonging ... Coming Together ... Listening and Learning ... Praying and Sharing ... Breaking Bread ... Going Out ... unlike some communion books for children, Alleluia! Amen does not embellish the liturgical text with unexplained pictures of Scruptural parallels or inspirational analogies from daily life ... the pictures relate directly to the text, and primarily show the liturgical action, with enough homey detail to make them fun to look at again and again. ... focuses on the Baptismal Mystery (its Scriptural roots in the story of salvation, its powerful images, its place in our worship together) ... has four chapters: God’s Saving Work (Creation, Flood, Abraham and Sarah, The Red Sea, the Promised Land, the Messiah, the Cross, the Resurrection, new life in the Spirit) ... Water and the Spirit (images of water, wind, fire, birth, death, rebirth; how the Church has used them to celebrate our new life in Christ) ... Christ’s Body and Christ’s Own for Ever—step by step through the order of Holy Baptism in the Book of Common Prayer. ALLELUIA! AMEN, The Sunday Paper’s Communion Book for Children (Episcopal Rite II), was published in 1984 and has sold over 70,000 copies. Its companion volume on Baptism, NEW LIFE, was published in 1986. Clergy and teachers find the books indispensable in preparing children and families for Baptism and Communion, and deepening children’s experience of the sacraments. ALLELUIA! 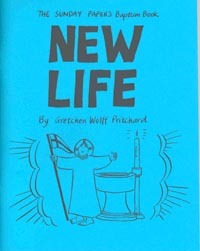 AMEN and NEW LIFE are 7 by 8 ½ inches in size, printed on heavy paper, and bound in brightly colored card stock. Each is about 80 pages long, in cartoon style, with big, bold pictures. 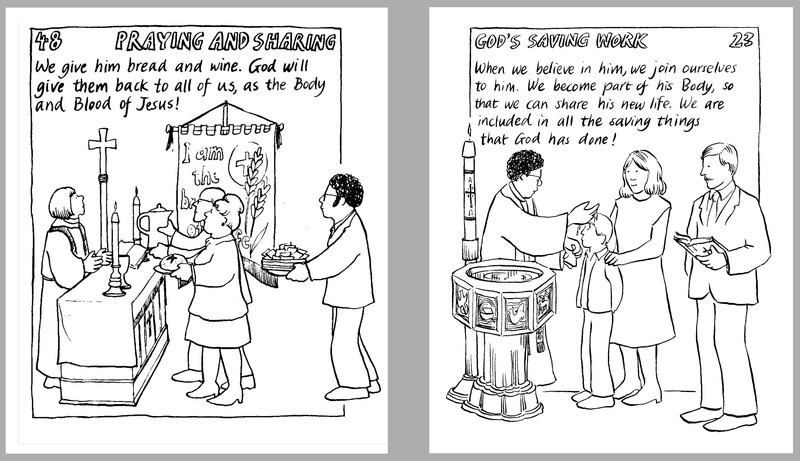 Each includes the complete people’s part from The Book of Common Prayer and most of the celebrant’s words, in easy-to-follow cartoon form, so that even beginning readers can follow along during the liturgy, while non-readers can relate to the clear, simple pictures of the church gathered for celebration. The drawings show a great variety of priests and people, church furnishings and vestments: all sizes, shapes and styles of God’s family. A holiday book about family and parish celebration! 78 pages. Illustrated with full-color photographs. 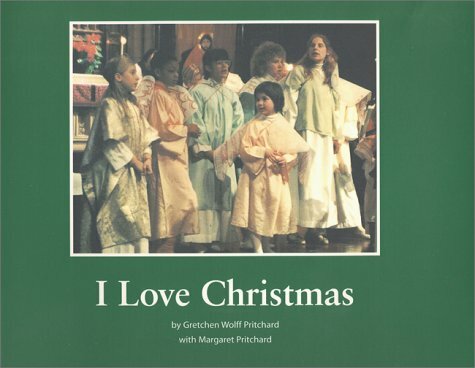 I LOVE CHRISTMAS is about celebrating God’s gift of a Savior as Christian families really celebrate it—in the family and in the Christian community, each with its special wonders. Ten-year-old Margaret introduces us to her family Christmas traditions—the home-made creche, the tree with real candles—and to equally well-loved traditions in her racially mixed urban parish, including a food pantry, late-night Eucharist, and the magnificent Christmas pageant, “People Look East.” (script available in “Go, Tell it on the Mountain” — see below). Children will share her joy in yearly rituals, growing in depth as she grows in understanding year by year, and her pleasure in Christian fellowship as young and old are drawn together in celebration and service, in song, story, and prayer. The description of the pageant incorporates quotations from Scripture and hymns, deepening the book’s message as a Christmas story. Full color on every page gives this holiday book the appeal of a family photo album. For children 8 to 12, or for reading aloud with 5 and up. 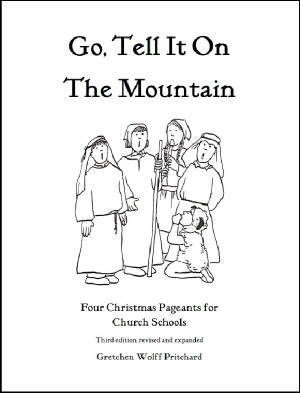 GO, TELL IT ON THE MOUNTAIN includes the scripts for four seasonal pageants: “Good News of Great Joy,” a Nativity play with carols; “A Child of Might,” a verse adaptation in verse of medieval mystery plays; “People Look East,” a dramatized service of lessons and carols with Eucharist (the pageant featured in “I Love Christmas”); and “"The Day of His Coming,” built around the readings for Advent IV and customized for Years A, B and C, making the pageant a fully rubrical liturgy of the Word for the last Sunday in Advent. The scripts may be used alone or as part of a Sunday service on any Sunday from Advent IV through the Christmas season. Full production notes are included. Purchasers of the book receive permission to copy the contents for use in their own congregation or ministry. 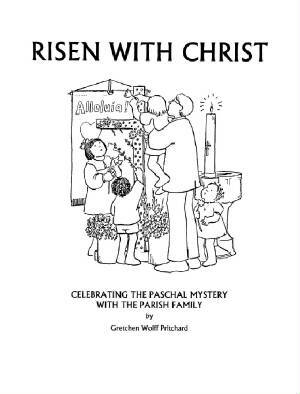 RISEN WITH CHRIST offers a rich variety of resources for celebrating Holy Week and Easter with all ages in the parish family. 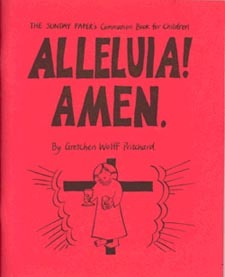 It includes suggestions for classroom and hands-on activities with children in preparation for Holy Week; an essay on celebrating the liturgies of Maundy Thursday, Good Friday, and the Great Vigil; and the full script, production notes, and sheet music for “The Lord of Life,” a pageant for Eastertide incorporating Scripture, movement and song. Purchasers of the book receive permission to copy the scripts and sheet music for use in their own congregation or ministry. TO ORDER BOOKS click on the “Order Forms” tab on this web site.